Do you have a question about FilterMag? Contact us! Within the tight clearances of modern engines, normal wear generates tiny steel particles that are carried away in your oil. These particles are so small they pass right through any standard oil filter. When the oil circulates back into the engine these same particles are carried into every lubricated space. This particle-laden oil will continue to lubricate but it will also cause an exponential increase in wear while it circulates. The longer you use the oil, the greater the wear. FilterMag extracts normal, wear causing, steel particles from your oil with its powerful, focused, magnetic field technology. Maximum Protection is a pair of FilterMags. 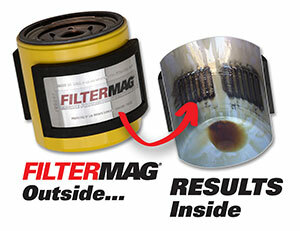 Two FilterMags expose almost all of your engine oil flowing through the filter to FilterMag’s powerful focused magnetic field. This provides twice the opportunity for FilterMag to capture wear-causing particles in your oil. How do I select the right size FilterMag? Search for your filter’s diameter at any filter manufacturer’s website. The TM-360 (Maximum Protection) has double the magnetic surface area as the TM-180 (Powerful Protection). Both are designed for installing externally on the outside of automatic transmission fluid pans. Be very careful with the TM-360 and TM-180. They are extremely powerful. Leave it in the box until you are ready to install. Wear safety glasses when installing any FilterMag, but especially with the TM-Series. How do I install the GP-101? The GP-101 is a bare magnet that must be installed internally on the inside of a steel differential or manual transmission housing cover. Be sure to install away from any moving parts. Be very careful with the GP-101. It is extremely powerful. Leave it in the box until you are ready to install. Wear safety glasses when installing any FilterMag, but especially with the GP-101. If your FilterMag doesn’t fit, or there are other issues with your order, contact us. We’ll make it right. Will FilterMag invalidate my car’s warranty? No. FilterMag’s snap on design is completely non-invasive so it has no effect on the flow of oil in your engine. Furthermore, it’s against US law (Magnuson-Moss Act) to automatically invalidate any warranty due to after-market additions. My engine has never broken down. Great! FilterMag will help make sure it doesn’t in the future. How would you feel about your engine lasting a lot longer? While FilterMag is a simple to use solution, it is derived from complex science and advanced engineering. Placing magnets on the outside (or inside) of your filter won’t have nearly the same effect. The FilterMag is a three segment system of which magnets are a key component. The size, shape, and surfaces of our magnets are designed to focus a magnetic field at the proper depth inside your filter. Our patented FluxCon shielding further focuses the magnetic flux into the filter while shielding the engine compartment from ANY magnetism to protect your vehicle electronics. To see more about the anatomy of a FilterMag you can click HERE. No. We use robust, temperature compensated magnets rated to 300ºF—well within any normal operating temperature of any engine or drivetrain component. Most ordinary magnets, however, do start losing magnetism around 178 ºF. For example, we have significant experience with off road racing. 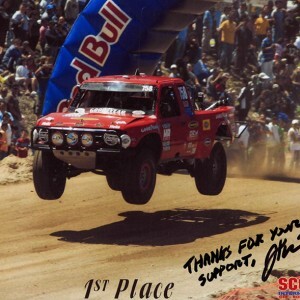 Specifically racing such as the Baja 1000 race. Many of these racers run FilterMags as they fly through the air and come crashing down from the jumps for more than 1,000 KM. We have never had a report of a lost FilterMag. 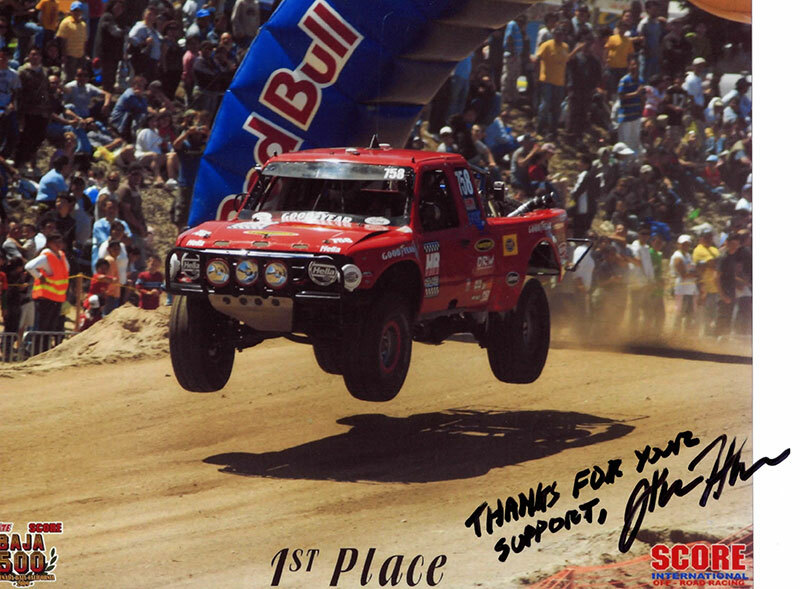 Shown below is one of the top off road racers in North America, John Holmes, who runs FilterMags for every race. I already use a premium oil filter. Why bother with FilterMag? It is always good to use a premium oil filter, but even a premium filter is limited to filtering particles larger than 20-25 microns in size. For an oil filter element to capture smaller particles, it would require a huge increase in overall size to accommodate the restriction to oil flow that would otherwise occur. Normal wear in your engine and drivetrain is driven by particles that are smaller than 20 microns. Eliminate those particles; wear drops dramatically and reliability goes up. FilterMag significantly limits NORMAL wear and tear on your engine and any other protected lubrication systems. How do you feel about your engine lasting 30% to 60% longer? The percentage of particles that are ferrous varies widely by type of equipment, operating conditions, maintenance state, and age, but generally speaking the majority of particles found in engine oil are steel. When FilterMags are installed and a used oil analysis is performed by independent laboratories, particle counts routinely drop by 50-82%. Studies show that this equates to a 30-60% increase in lubricated component life. Will FilterMag work on cartridge style oil filters that fit inside plastic housings? FilterMags can be band-clamped to the outside of cartridge style filter housings. For more information click HERE. Many oil pan drain plugs and automatic transmission fluid pans already have magnets. Many manufacturers do use drain plugs and transmission pans with magnets. These are designed to be visual diagnostic indicators. When your fluids are changed, technicians examine the drain plug and transmission pan for any strange looking debris. These magnets are too small and too weak to be effective as magnetic filtration devices. We warrant FilterMag consumer products to be free from manufacturing defects for a period of one year from the date of purchase. If you need to return a FilterMag for any reason please contact us in advance for a Return Authorization number. We want you to be happy with your purchase. If you have any problems just let us know so we can help. To see our full warranty please click HERE.